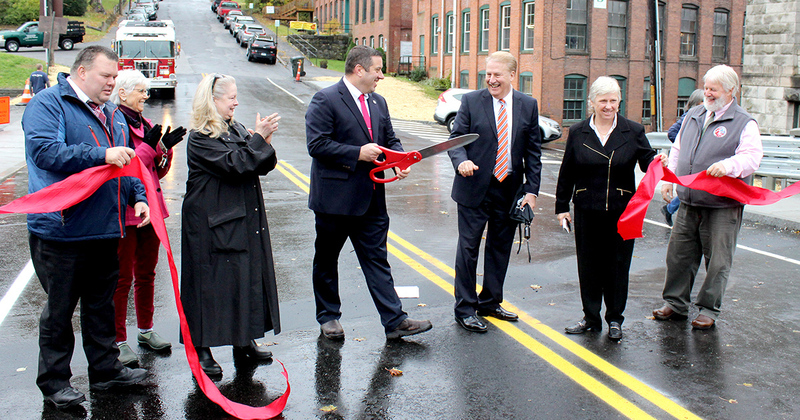 WINSTED — State Rep. Jay Case on Monday joined state and local officials in opening the Holabird Avenue bride to traffic. Case, who represents the 63rd House District, was instrumental in securing funding to repair the bridge that’s considered critical not only to residents in the area, but also business owners and first responders. The project took roughly two years to complete. Case was joined by members of the town’s Board of Selectmen, town manager, and state Sen. Craig Miner. Former state representative David Scribner, who served as chairman of the legislature’s Transportation Bonding Subcommittee, was also on hand for the event. Scribner worked with Case to secure the funding after Winsted’s state representative brought him to town to look at the bridge.